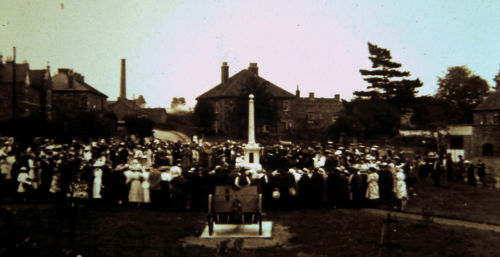 Kingswood, like many towns and villages, witnessed losses as a result of the First World War, but there were also opportunities for industries. Kingswood was one of the main boot and shoe manufacturing centres, with around fifty different companies. At the G.B. Britton factory on Soundwell Road, Kingswood, not only did the company lose many of the experienced production staff, but at the same time government orders soared. The Douglas Motorcycle Company also played a key role when they were called upon to accelerate production. 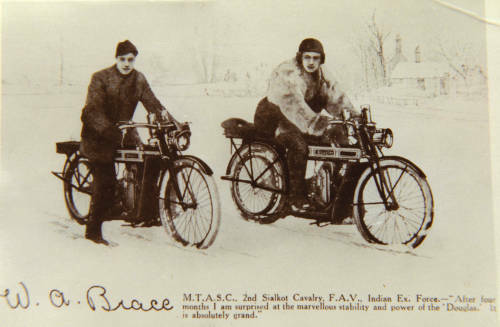 The motorcycle performed a key role in maintaining good communications. The Douglas factory was awarded an important contract and by the end of the war, the factory had provided more than 25,000 machines for the military. At Warmley, Isaac Crane established a Firework Factory in the 1890s. At the outbreak of the First World War firework production ceased and large supplies of the British Mills Bomb and hand grenades were leaving the site via Warmley Station for the War zones. The Duke of Wellington once said “The British army marches on its belly” however the 20th century army marched on their feet and in many cases boots that were manufactured in Kingswood. 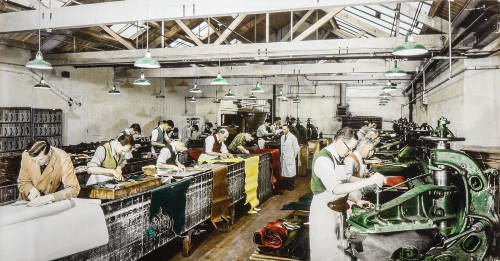 The Douglas factory was well placed in the post war years to become one of the premier Motorcycle manufacturers of Great Britain and the largest single employer in East Bristol.